The territory of Romania is considered by a significant number of the Balkan Vlachs as their real motherland (for the reason that it is the only state of the neo-Latin speakers in South-East Europe) or the national state of the Vlachs regardless on the fact that they are not originating from Romania. Outstandingly, the Romanian intellectuals (especially the linguists) and politicians expressed during the last century and a half a high level of attention to all neo-Latin speaking groups in South-East Europe claiming that all of them belong to the Romanian nationality. Accordingly, the leading theory about the ethnogenesis of Romanian (i.e., neo-Latin) speakers in the region is framed as it is presented in the next paragraph. 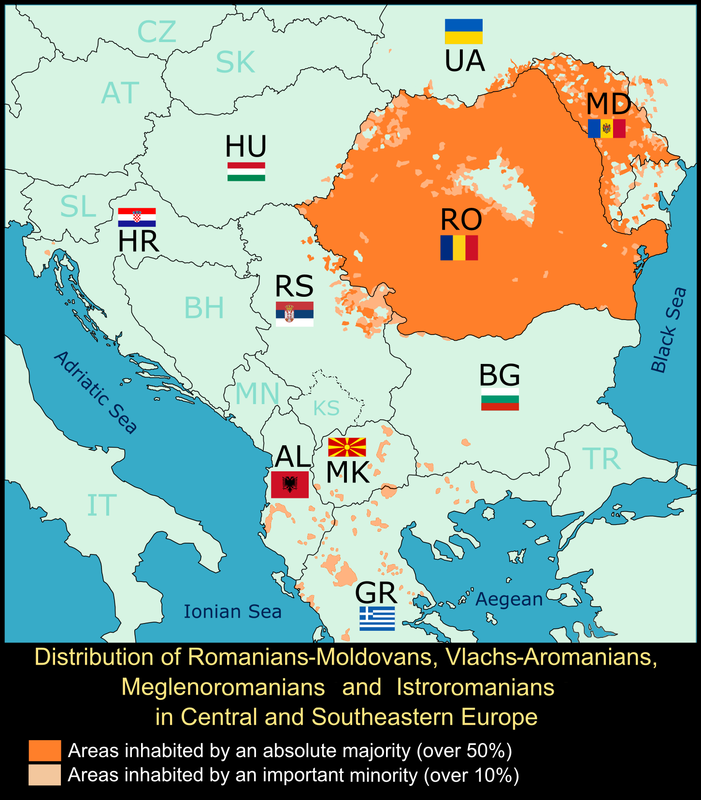 The Romanians are descendants from old Thracians who inhabited a vast part of the Central and South-East Europe in the pre-classical age (from Poland to Greece). A language of the ancient Thracians was of the same kind as the ancient Baltic, Slavic, Iranian and it was a part of the language group that is known for the linguists as satem. During the Roman period, the Thracians within South-East Europe lived on the territory of present-day Romania, Moldova, East Serbia and Bulgaria. The Greco-Roman geographers and historians named the Thracian tribes who lived between the Carpathian Mts., the Balkan Range and the Black Sea as the Dacians or Getae. These ancient Geto-Dacians, who had their settlements on both banks of Danube river, were the ethnic base for the formation of present-day neo-Latin speakers in this part of Europe who calls themselves as the Romanians or the Aromanians (the Vlachs). In any case, the Latinity became the main feature of the Romanian nationality and it resulted from the process of Romanization. As the language is the essential aspect to define an ethnic identity and since the old Latin language creates the core of a modern Romanian language it is understandable why the Romanians call themselves by this ethnonym. Finally, there is a long tradition that the Romanian people considered the ethnonyms Vlach and Romanian as the synonyms: for instance, the representatives of Transylvanian Romanians sent to the Habsburg emperor Leopold II (1790–1792) in March 1791 and in March 1792 the written requirements upon the political status of the Romanians in Transylvania under the title Supplex Libellus Valachorum. A territory of present-day Romania had a great attraction for the Vlach migrants from the Balkans in the Middle and New Ages since the two semi-independent principalities of Romanian-speakers existed at that time: Wallachia and Moldavia. Both of them have been considered as the countries with flourishing economic activities and unwavering central authorities. One of the crucial national-political institutions that played a decisive role in the Vlach migration from the Balkan peninsula to the independent state of Romania (which was made by the unification of Wallachia and Moldavia in 1859 and became internationally recognized as an independent in 1878) was the “Macedo-Romanian Committee”. It was established in the early 1860s in Bucharest and financed by the Romanian government. The prime political goal of the committee was to work on the national renaissance of the “Romanian language speakers” for the unification with their “motherland”. The most remarkable success of the committee was opening about 100 Romanian schools within the Ottoman Empire and attraction of the Vlachs to migrate to Romania, particularly to the region of Dobruja. For instance, the Romanian authorities granted the privileges to all Vlachs from the Balkans in 1925 to come to the province of Dobruja where the Romanians composed lesser than a half of all inhabitants. However, the local population in this province, either of the Romanian origin or not, expressed a certain level of antagonism toward the new (Vlach) colonists that compelled many of them to migrate to other parts of Romania. Today, Romania’s Vlachs make a community of some 50,000 to 70,000 people, but a majority of them accepted Romanian national identity although with a sense of having a distinctive vernacular in comparison with the literal Romanian language. The Romanians regard the Vlach language customarily as a (not standardized) dialect of Romanian. The Vlachs as a population are considered as a cultural minority of Romanian kinship. Romania’s Vlachs are in comparison to all other Vlach communities in the region most exposed to the assimilation due to the linguistic similarities with the members from a majority-community. Within the whole territory of the former Yugoslavia, the Vlachs have been most numerous in Serbia. In the Cold War period, Yugoslavia’s Vlach enjoyed the highest level of minority protection in comparison to the other states in South-East Europe. Nevertheless, some of the Vlach representatives complained at the end of the existence of ex-Yugoslavia for the lack of the language and religious rights for this community especially in the Socialist Republic of Macedonia. Ex-Yugoslav authorities developed the so-called “three-tier system” of ethnonational rights according to which all ethnonational groups have been classified into three levels of the rights: a) the Nations of Yugoslavia (Slovenes, Croats, Serbs, Muslims, Montenegrins, and Macedonians); b) the Nationalities of Yugoslavia (Slovaks, Turks, Czechs, Italians, Romanians, Gypsies, Ruthenians, Hungarians, and Albanians); and c) the Ethnic groups of Yugoslavia (like Austrians, Greeks, Jews, Vlachs, Ukrainians, Russians, Poles, etc.). Officially, the minority status in the country was not recognized and all citizens of Yugoslavia had been equal in terms of culture, language and political rights. However, some de facto minority groups enjoyed the right to have a territorial and administrative autonomy (the Albanians and the Hungarians), while others did not. The majority of Serbia’s Vlachs live in the easternmost part of the country around Timok river (the so-called “Timok Vlachs”). According to some scholars, a majority of them have been resettled from the Principality of Wallachia, Transylvania, and Banat to this area (Тимочка крајина) by the Ottoman authorities in order to repopulate the region. The majority of inhabitants of the lands along Danube river of this portion of Serbia, which is on the border with Bulgaria and Romania, are the Vlachs: 151 settlements are purely Vlach; while in 42 settlements they mixed with the Serbs and the Bulgarians. The Romanian authorities claimed that in the interwar period there were approximately 120,000 “Romanians” (the Vlachs of a neo-Latin language) in the Bulgarian part of Timok valley, which separates Serbia from Bulgaria. According to official Serbia’s statistical data, at the end of the 20th century (the 1981 census) there were 135,000 speakers of the Vlach language, but only 32,000 of them declared themselves to be of the Vlach ethnicity. The rest of the Vlach speakers identified themselves as the Serbs. The Serbian authorities called them as the Serbs of Vlach language. However, some researchers increase the number of Serbia’s Vlachs to 200,000. Many of Timok Vlachs, who came to the area from Banat, and Transylvania, called themselves, and are known by the local populace, as the Ungurens (i.e., the Hungarians) since they migrated from historical lands of the Kingdom of Hungary. However, those Vlachs who migrated from the Principality of Wallachia (which had an ancient name of Tara Romaneasca) are known as the Tarans. The latter are living as well in the Vidin area of North-West Bulgaria. During the Ottoman rule, the Vlachs from the Timok area (in Serbia) and the Vidin district (in Bulgaria) maintained intensive relations and were considered as a single compact group of the Vlachs. An establishment of the new political borders in the area (firstly between Serbia and Turkey in 1830/1833 and later between Serbia and Bulgaria in 1878), which followed the process of liberation of the Serbs and the Bulgarians from the Ottoman mastery, separated the Timok Vlachs from those who lived in the vicinity of Vidin. Consequently, many of the Vidin Vlachs accepted either as first or second ethnic identity to be Bulgarians, while a majority of the Timok Vlachs identified themselves as the Serbs (but of the Vlach language). It is very often that the Timok Vlachs would listen and perform Serbian folk songs and respect Serbian national customs and culture. Serbia’s Vlachs have been quite positively considered and highly rated by the Bulgarian Vlachs in the time of the Socialist Yugoslavia due to their economic prosperity, right to freely express their ethnic self-nomination and greater individual freedoms. The census of 1981 showed that the Vlach ethnicity was not understood as a very deep identity, at least not enough rooted in order to survive on the political scene, but it is perceived as a strategic choice (for the practical reasons) of majority of the community, who opted to belong to another identity group (but preserving the mother tongue) in order to obtain more privileges and better position within the society. From this example is clearly seen that for some Vlach micro-communities the ethnic group and linguistic group can be differentiated from the each other. From the Vlach perspective, to be at the same time ethnic Serb (or Bulgarian as it is aforementioned) and linguistic Vlach does not affect the Vlach self-identity, but for sure it finally leads to the Vlach silent assimilation. The Vlachs participated in the process of ethnogenesis of the Serbs as certain percentage of the Vlachs who lived in the Middle Ages in the Kingdom (Empire from 1346 to 1371) of Serbia and later in the Ottoman times within the borders of jurisdiction of revived Serbian Patriarchate of Peć (1557–1766) became included in the process of Serbization of not originally Eastern Orthodox Serbs. Consequently, it is extremely difficult to define the balance of ethnic Serbs and those Vlachs who accepted Serb national feeling within the population of the Eastern Orthodox believers who emigrated from the Ottoman provinces of Montenegro, Serbia, Herzegovina, Macedonia and Bosnia and resettled themselves on the territory of the former Habsburg Monarchy and Venice (the present-day territory of the Republic of Croatia). In other words, the Venetian and Austrian provincial and central authorities very often mentioned in the sources and official documents these migrants as the Vlachs (in Austrian case) or the Morlacchi (by the Venetians). However, in the same sources, these Vlachs or Morlacchi are recognized to be of the Serb customs and language. A historical presence of the Vlach population on the territory of Serbia is preserved in the names of the rivers, villages, mountains, etc. For instance, at the end of the 19th century, there were 25 villages in Serbia with the name derived from the Vlach ethnonym. At the same period of time, the Vlachs were the biggest minorities in Serbia with 7,47% of the total Kingdom of Serbia’s inhabitants, living between Grand Morava, Danube, and Timok rivers. Majority of them originated from the migrants from the north of Danube. The status of the Vlach minority in South-East Europe is characterized with a shortage of authoritative resources, cultural, linguistic and political subordination to the ethnolinguistic majority environment, social, economic, and territorial (administrative) marginalization and, finally, with a long-standing process of tranquil assimilation especially by the Orthodox majority(s) due to the long-term cohabitation and familiarization. Ferdinand Toennies, a primordial theoretician of phenomena of ethnicity, divides modern ethnonational groups, according to their self-identity criteria, into the community of blood, the community of place and the community of spirit. However, the Vlach self-identity apprehension does not fit to these three patterns. The Vlach pattern of self-identity could be called as a community of language. For them, their language became the last stronghold of the ethnic spirit and a shield of their group self-identity. Therefore, the preservation of the Vlachs in the Balkans, as a separate ethnolinguistic minority in several regional states, primarily depends on a successful self-saving and maintenance of the Vlach language. However, the attempts to preserve the Vlach language and culture could not be fruitful without improved legal provisions and a real practical help by the governments of the Balkan states. Firstly, the Vlachs are identifying themselves in cultural terms (primarily by the mother language as a vital minority cultural identity issue and crucial “distinct character”). Secondly, they in recent times claim special collective cultural rights within the regional societies in order to preserve their collective cultural identity and authenticity as a specific way of life that is typical of their particular group, which separates the Vlachs from the others and forms its unique ethnic image. 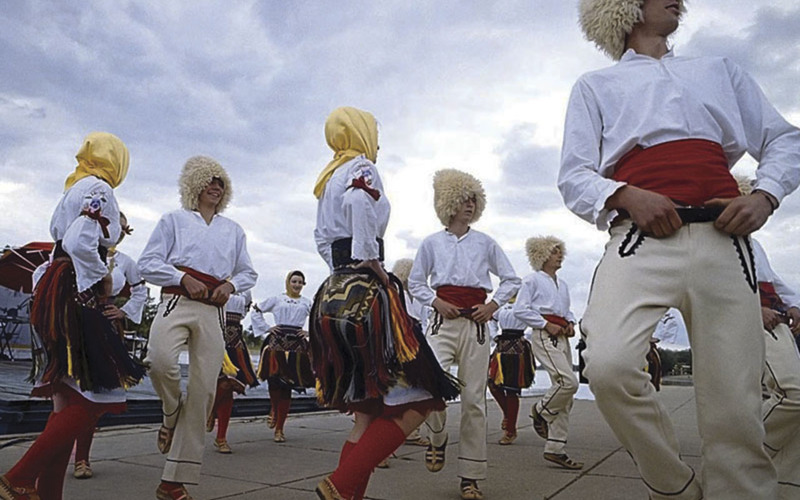 However, the members of majority-ethnicities have an impression that the Vlach minority culture is insignificant. Nevertheless, the political changes in the region after 1989/1990 did away with the obstacles to free profess religion and to express the ethnic identity that would lead to slow down Vlach assimilation. The process of modernization, especially its features of urbanization and industrialization, meant various forms of cultural, and even ethnic, assimilation of the Vlachs in South-East Europe. Assimilation of the Vlachs in many cases was done under the policy of suppression of their cultural identity. However, the opposite case might lead to self-segregation and even conflict with the majority of society. The future task of the regional administrations and communities is to find a proper policy to provide the best conditions under which the Vlach minority (and other minorities) would express its specific cultural features, but without antagonizing the other members of the society. The exercising cultural rights of minority communities have to be framed and respected within the set of general human rights. As a final point, an intercultural dialogue is needed in order to overcome mutual suspicion and enable the joint participation in the power of representatives of the majority and the minorities. This will ensure a political protection of the interests of minorities, which would not confront them with the rest of the population. Thus, minority cultural rights will not antagonize but harmonize political and other interests. For instance, according to the 1981 census, in the district of the city of Bor there were 10,29% Vlachs. C. Noe, M. Popesco-Spineni, Les Roumains en Bulgarie, Craiova, Ramuri, 1939, pp. 86−88. Statistical Yearbook of Yugoslavia 1988, Belgrade, 1989, p. 442 (in Serbian); R. Petrović, Etnički mešoviti brakovi u Jugoslaviji, Beograd, 1985, pp. 32–36. There are Bulgarian scholars who found pieces of evidence that parts of the Timok and the Danubian Vlachs have an ethnic Bulgarian origin. They are champions of the theory of “double migration across the Danube”, i.e., that majority of the Danubian, Timok and Vidin Vlachs originate in ethnic Bulgarians who once upon a time migrated from Bulgaria to Wallachia in order to escape from the Ottoman lordship. However, one part of them later resettled in North Bulgaria and East Serbia while other part stayed in South Romania. Those Bulgaro-Vlachs, when resettled in North Bulgaria, brought with themselves corrupted the Romanian language. This theory is partially confirmed in the Vlach oral tradition from the area of Vidin. This is an example of applying the rational choice theory to ethnic identity and interethnic relations. The proponents of this direction of thinking stress that the individuals are trying always to choose the most optimal option from the corpus of available alternatives of ethnonational identity; i.e. they are choosing such alternative which may give them the highest gains and benefits. Accordingly, the ethnic (or national) group is only a coalition of individuals and a result of their rational way of thinking, which helps them to obtain as better as a position in economic and political competition [M. Banton, “The Actors’ Model of Ethnic Relations”, J. Hutchinson, A. Smith (eds. ), Ethnicity, Oxford: Oxford University Press, 1996, pp. 98–104]. According to many authors, the notion of particular ethnicity is a product of social relations rather than a “natural” essence. At any case, the character of ethnicity is a “variable and never ending process, through which the actors identify and are identified by the others on the basis of the Us-Them dichotomies established on the basis of cultural features, which are presumed to have derived from common origins and which are distinct in social interactions” [P. Poutignat, J. Streiff-Fenart, Théories de l’ ethnicité, Paris: PUF, 1995, p. 154]. In this article, we regarded an ethnic group as a part of an ethnie that is living either in a non-national state or in a non-national-language environment, but preserved its language, culture, customs and are aware of its ethnic self-identity. Still, the Vlachs identified themselves as different from their neighbors from the points of language, culture, tradition, customs, and origin. L. Wolff, “Disciplinary Administration and Anthropological Perspective in Venetian Dalmatia: Official Reflections on the Morlacci from the Peace of Passarowitz to the Grimani Reform”, D. Roksandić, N. Štefanec (eds. ), Constructing Border Societies on the Triplex Confinium, Budapest: Central European University Budapest, History Dept., Working Paper Series 4, 2000, pp. 47–56. В. Карић, Србија. Опис земље, народа и државе, Београд, 1887, pp. 92–93. F. Toennies, “Community and Association”, Sotsiologicheski Problemi, № 4., p. 103.